Texas House Speaker Joe Straus requested on Tuesday that a contentious Confederate plaque be removed from the Capitol. “This is not accurate, and Texans are not well-served by incorrect information about our history,” Straus said in a letter to the State Preservation Board, which oversees the Capitol grounds. 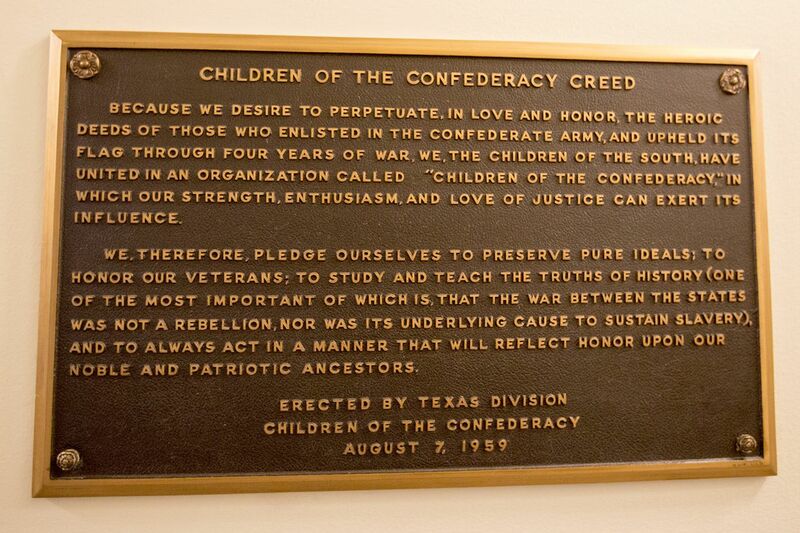 “The Children of the Confederacy Creed plaque does not meet this standard,” Straus wrote. State Rep. Eric Johnson, D-Dallas, who has called for the removal of the plaque, told The Texas Tribune he was “pleased” that Straus agrees it should come down. “I am confident that it will come down soon,” Johnson said. See here for the background. As you know, I am objectively anti-Confederate monuments in general, though I will stipulate there is room for debate. But a Confederate monument that contains a blatant and obvious lie about what the Confederacy and the Civil War were about? In the state Capitol? I’ll be glad to drive to Austin with a hammer and pry bar and do the removal myself. Good on Rep. Johnson for bringing this up, and on Rep. Straus for doing the right thing. There was a post on big jolly that really hit the mark. The plaque in question says the civil war was not about slavery. That is a historical lie. The document passed by the state legislature to leave the Union referenced slavery several times as a reason to leave. The plaque should have never been put up. It should come down. The plaque rewrites history. Slavery was A reason, not the only reason. There are all kinds of states rights issues that got trampled underfoot by virtue of the South’s loss. Think about it. Everything you hate about Trump strong arming state and local governments? Upset about Uncle Sam fighting sanctuary cities? Upset about Uncle Sam (potentially) going after pot in state legal pot states? Blame the outcome of the Civil War. As to removing the statues, I’ve got to say no. The line needs to be held here. There are already voices calling for Washington, Jefferson, even Sam Houston statues to be removed next. People that rabidly insist that statues be pulled down will never be satisfied, never be placated. It will just be one drama after another. The easiest way to address that is to just say no to all of it. Bill Daniels everything in your post is a fabrication. Got a cite for the calls to pull down Washington statues? How about something that trumps the declaration(s) of causes of secession, which clearly state that slavery was the PRIME reason for secession. Maybe it’s time or you to stop talking and start listening. You clearly need to learn to pick your spots better.